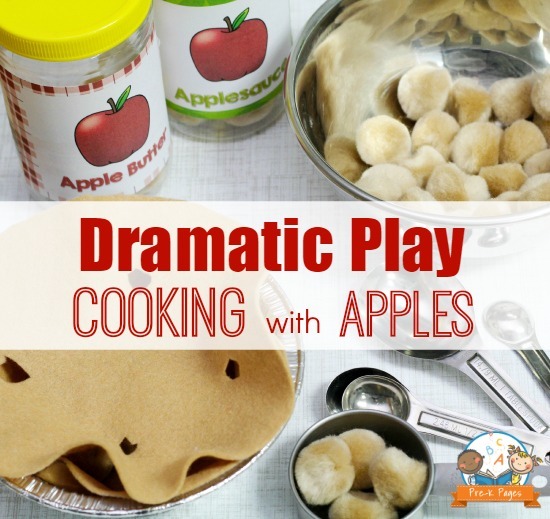 These apple activities for your dramatic play apple orchard center are both fun and educational. Your kids will love to pretend baking apple pies, cooking apple butter and applesauce and more! I used brown pom-poms that are similar in color to cooked apples. Invite the children to use the pom-poms to cook and bake apple goods to sell in the dramatic play apple orchard market stand. Estimation: How many more pom-poms will fit in this jar? Counting and Measuring: How many scoops of apples will fit in the pie? More and Less: Which jar of applesauce has more apples? Which jar has less? In the picture above you can see the plastic containers I used to hold the pretend apple butter and applesauce. The children scoop and pour pom-poms into the containers to create apple butter and applesauce to sell at the apple orchard market. I also created a free set of labels for you to use in your dramatic play apple orchard, keep reading to grab your copy! I created a video tour of my apple orchard dramatic play center, I hope you like it! Here are the supplies you will need to create your own felt apple pie. 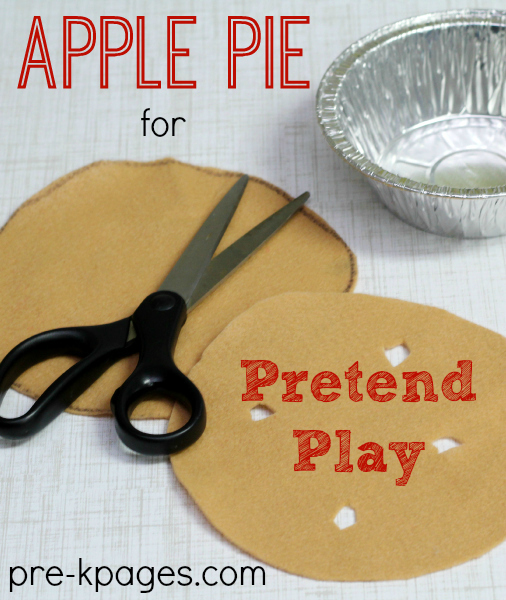 To create an apple pie for pretend play, first use the marker to trace around a small paper plate on the felt. Trace two circles, one for the top crust and one for the bottom crust. Next, cut out the circles and make a few small cuts in the top crust to resemble the vents in the top of a real pie. 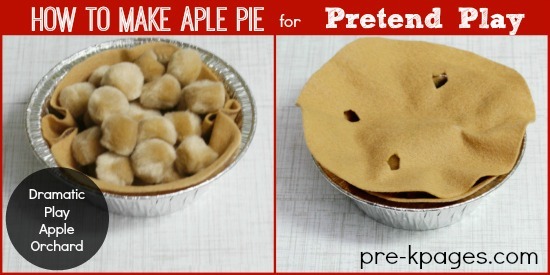 Then, place the pom-poms, felt crust, pie pans, and cooking utensils in your dramatic play center and watch the kids have tons of fun creating apple pies! 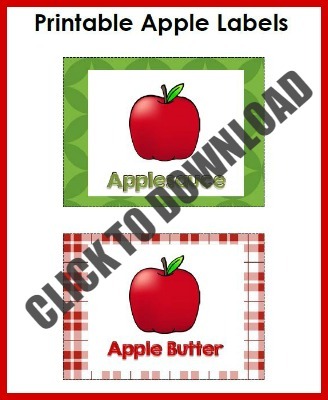 Click on the picture above to download the free printable apple labels for your dramatic play center. Just print the labels, cut out, and attach to the front of plastic containers.